Cows freshen after a calf's birth. Freshening occurs when milk production begins. She's then a "wet" cow, as opposed to "dry," non-milk-producing animal. Although nature intends the milk for the newborn calf, that's not the typical human use. The dairy calf might suckle the colostrum, the initial milk chock-full of nutrients and antibodies, but after 48 hours regular milk production starts and cow and calf are separated. Cow gives birth to their calves after a nine-month gestation. Usually, dairy breed heifers give birth to their first calf at age 2, so that's when they freshen and join the herd. 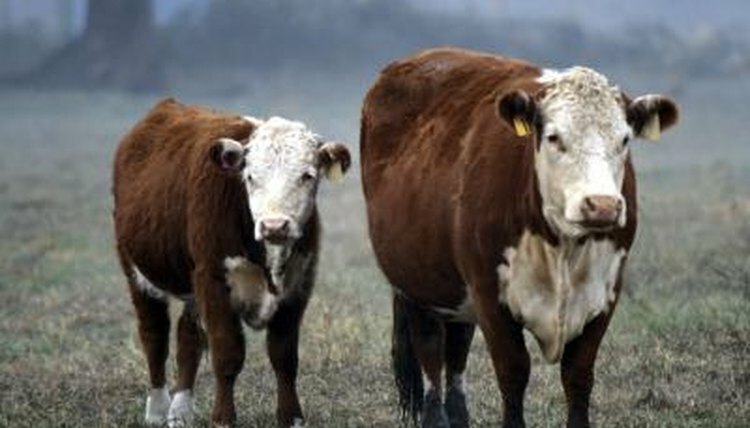 Beef breed heifers might give birth initially at the same age, but their calves might nurse off their mothers. In the dairy breeds, male calves are usually destined for feedlots, while the females are fed commercial milk replacer and raised for future milk production. When the cow freshens for the first time and becomes part of the milking herd, her life undergoes a lot of changes. Instead of living in a herd of cows her age, she's probably in a mixed-age herd, perhaps including her own mother. These older cows rule the roost in the herd. She must adjust to the twice or thrice daily routine of milking, which includes udder cleaning and hook-up to the milking machine. She's also exposed to a lot more human contact than in her earlier life. Cows produce the most milk within four to six weeks after calving. Depending on the breed, a cow might produce between 4 to 12 gallons daily. Most cows are milked for approximately 300 days before being given time off to prepare for the next calving. Professional dairies keep careful track of each cow's daily milk output. Cows whose production is substandard are culled from the herd. Dairy cows are bred by artificial insemination not long after calving, in preparation for next season's calf. She's generally allowed to "dry" about seven months into her pregnancy. By that time, her milk production is lower, so drying usually consists of cutting back on milking and the amount of grain fed. When she stops producing milk, dairy farmers continue feeding her large quantities of hay or keep her on pasture. Allowing a two-month dry period before her next calving lets her mammary glands rest and prepare for the new baby and subsequent freshening.